Vascular disease and disorders of the upper-extremity are uncommon, but ones that may have lasting implications. Arteries bring oxygenated blood from the heart to the fingertips and veins return the used blood back to the heart and lungs. 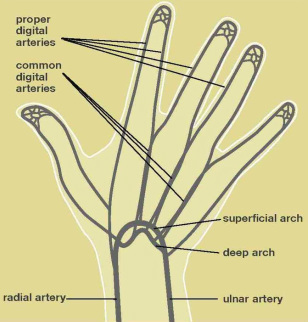 At the level of the wrist two major arteries bring blood into the hand: the radial and ulnar arteries (see Figure 1). Variations in the anatomy are common, though, which may affect the way blood flow ultimately reaches each finger. Figure 1. Vascular anatomy of the hand. Trauma – Penetrating trauma such as a knife wound may damage the blood vessel. Occasionally, a seemingly innocuous cut appropriately located will cause major damage, or sometimes a blunt injury can bruise the vessels enough to cause a clot and stop the blood from flowing to the fingertips, which turn white, cold, and painful. Immediate reconstruction is usually necessary if blood flow has stopped. Other injuries may not be as severe, since there may be a variety of different arteries that can continue to provide blood flow to the area. Aneurysms – An aneurysm is a localized weakness of the vessel wall that results in an isolated expansion of the vessel, like a balloon popping up (see Figure 4). Usually these present as a soft painless mass over the vessel. The vessel may become blocked through the formation of a blood clot or may even shower small clots to the fingertips. Aneurysms of the wrist may cause cold intolerance, pain or numbness as they enlarge, and can occasionally cause gangrene of the fingertips. Vascular malformations – When an abnormal connection exists between the veins and arteries, excess blood is shunted through these small vessels, which may become large and produce symptoms. When a significant volume of blood is re-directed through these small connecting vessels, patients can experience pain, sweating in the area, heaviness, increased temperature and hair growth, and spontaneous bleeding. When small, treatment may be as simple as a compression glove. However, when large and destructive, treatment might require surgical excision. Raynaud’s – Raynaud’s disease describes a condition in which the arteries in the fingers go into spasm, depriving the finger of blood flow. The fingers typically change color, going from white to blue, then red as the spasm resolves and blood flow returns. It often occurs when the hand is exposed to cold or tobacco. Treatment entails cessation of smoking, avoiding cold weather, use of protective garments (e.g. mittens, gloves), and occasionally medicines that can help dilate the vessels and improve blood flow to the fingertips. When unresponsive to these measures or a non-healing ulcer is present, surgery to separate the nerves from around the vessels may be considered, to relieve the effect of the sympathetic nerves that contributes to spasm of the arteries. Figure 2. Doppler ultrasound of the radial artery. Doppler or ultrasound examination of the blood flow in the arteries and veins (see Figure 2). Segmental arterial pressure and pulse volume recordings, which assess the quality of blood flow in the vessels using small blood pressure cuffs and ultrasound transducers placed on the fingers and arm. Magnetic resonance angiography - A MRI of the affected area is performed with special attention dedicated to the vessels (MRI/MRA) (see Figure 3). Cold stress test – used to assess the severity and reversibility of vessel spasm. 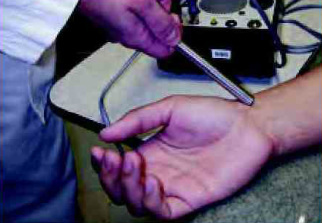 The temperature and blood pressure in the finger(s) are recorded before and after the hand is immersed in cold water. 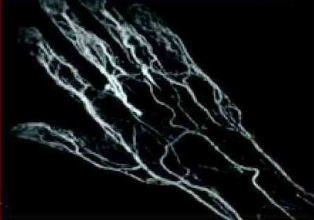 Arteriography- Contrast is injected into the vessel and X-rays taken of the hand and arm. This is the most invasive test but also depicts the most detail of the vessels. Treatment for vascular disorders depends on the condition and may include surgery to repair injured or malformed vessels, or to remova a tumor, behavioral modifications such as smoking cessation, and medications such as calcium channel blockers to treat vasospams. Figure 3. Magnetic resonance angiography (MRA) of the hand. Figure 4. Two different types of aneurysms of the hand.